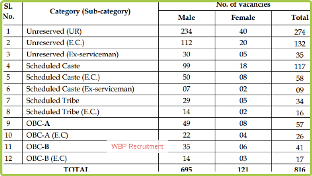 West Bengal Police Recruitment Board(WBPRB) has recently published notifications on the official website for recruiting 3000 Excise Constable 8419 Constable and 816 Warder Vacancies. WBp Jobs aspirant who searching for latest police Recruitment in WB can check this job alert. We have found the official notifications and providing short information for our readers. Let's check short information on this WBP Recruitment 2019. Madyamic(1th Standard from West Bengal Board of Secondary Education(WBBSE) or equivalent board. Category wise vacancy details are below. •UR 1170•Unreserved(EC) 480 •SC 450 •SC(EC) 210 •ST 120 •SC(EC) 60 •OBC(A) 210 •OBC(EC) 90 •OBC(B) 150 •OBC(EC) 60 posts. There are 3000 total Excise Constable will be recruited in West Bengal Police. ***Please read the official notification for physical standard and other criteria. Look at the image to get full WBP Warder Vacancy Details. Category wise vacancy list is provided. West Bengal Police Recruitment Board will select candidates through the preliminary test, PST, PET, Final written exam and interviews. To participate in this WBP Recruitment the candidates must be qualified Madhyamic(10th Standard) from a recognised board..
An image has shown below to for category wise vacancy details. You can see the full list of category and vacancy details. West Bengal Police Recruitment Board will select candidates through the preliminary test, physical standard and efficiency test and main exam. More information on the official notification. ►Do you need more Job news of other department or post? we have already discussed some other latest jobs before this WB Police Recruitment 2019. You may check for eligibility criteria an online form to apply.